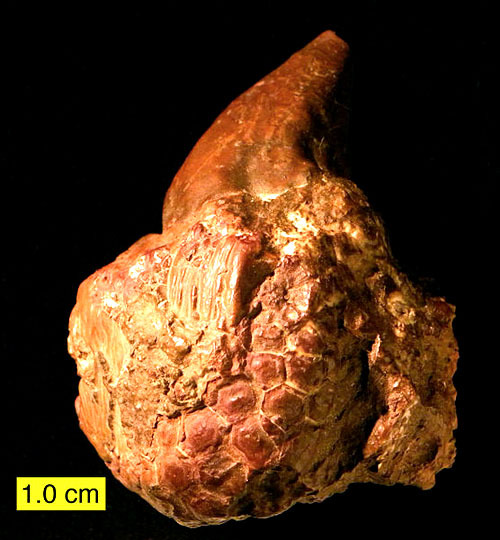 Platyceratid snail (Palaeocapulus acutirostre) on a crinoid calyx (Logan Formation; Mississippian of Wooster, Ohio). Platyceratid gastropods are a Paleozoic group most famous for parasitizing crinoids. They drilled small holes through the crinoid thecal plates and apparently slurped out the gut contents of the unfortunate echinoderms. We usually find platyceratids only as isolated shells (as below), so to be given a specimen of a crinoid calyx with a platyceratid still in place is a treat. Wooster students are fortunate to see it, and once again a donor makes a lasting contribution — even in a single fossil. 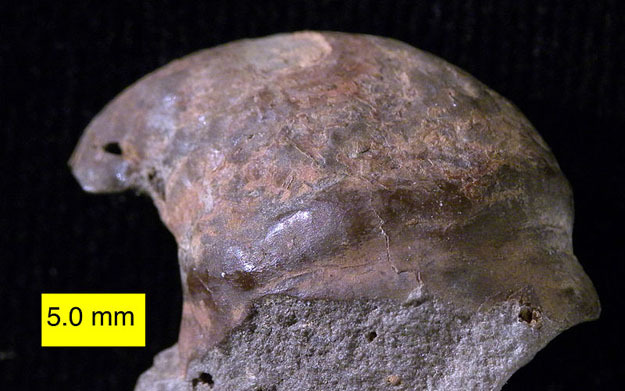 Platyceras pulcherrimum from the Logan Formation (Mississippian) of Wooster, Ohio.